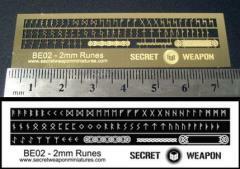 Perfect for any Dwarf or Space Wolves army - but applicable to any miniature and any range - these 2mm runic letters are photo etched brass in 0.01" material. Simply cut the letters from their tabs and apply them to your models to create serial numbers, squad identification, slogans or devotional text. Your imagination is the only limit!